Our Doctor of Business Administration programme in-take is now full. If you are interested in registering your interest for our next intake please email [email protected] with your full details and insert DBA 2020 in the subject line. What is the Doctor of Business Administration? The DBA programme focuses on the application of theoretical knowledge to the advancement of management and business practice, and is designed to develop the analytical, conceptual, and critical thinking skills of senior business and management professionals. This is a distinctive, research-issue driven programme that is orientated towards senior executives in managerial roles, and combines workplace and professional engagement with the scholarly rigour of the academic institution. This qualification is increasingly recognised by international business and management schools as the most appropriate post-MBA (or equivalent Master degree) route to combining academic research on management and business with further personal and professional development. The four year part time programme is innovative in its structure, combining three significant milestones on the doctoral process; advanced research skills workshops, cumulative paper series and the completion of the DBA thesis, all of which centres around addressing an organisational issue of interest. The programme is designed to facilitate senior manager access, with a 2-3 day block on campus each semester. The WIT DBA utilises a blended learning approach, combining the latest technologies for remote access and communications. The DBA is the international post-masters qualification for senior management advancement. This business doctorate develops management expertise through rigorous research design, positioning the DBA graduate for rapid organisation and career progression. The DBA thesis submission and defence accounts for the remaining one third. Each stage incorporates a number of 1-3 day workshops and independent research, maintaining a balance between peer-learning and self-led learning within the programme. We aim to develop the participant’s ability to undertake independent research at an advanced level and make a significant contribution to knowledge and professional practice through the evaluation of business management structures, contexts and processes. 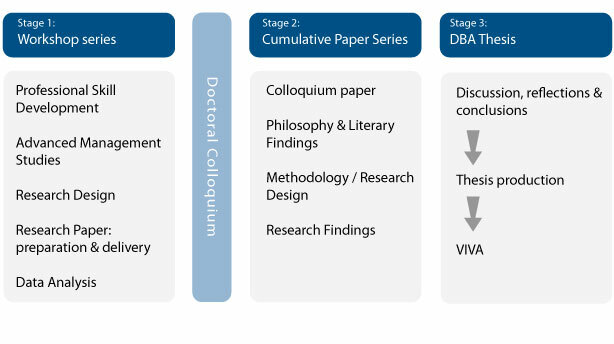 Following completion of a series of workshops and the colloquium in Stage 1, students will then research and write up a series of research papers in Stage 2, guided by an academic mentor and a WIT working paper series, before submitting and defending their thesis in Stage 3 of the programme. Dempsey, D. and Kelliher, F. (2018) Industry Trends in Cloud Computing: Alternative Business-to-Business Revenue Models, UK: Palgrave Macmillan. Coady, P., Byrne, S. and Casey, J. (2017) ‘Positioning of emotional intelligence skills within the overall skillset of practice-based accountants: employer and graduate requirements’, Accounting Education, [Online]. Available at: http://www.tandfonline.com/doi/full/10.1080/09639284.2017.1384741 (Accessed 26 October 2017). Corcoran, N. and Duane, A. (2018) 'Management Support for Staff Knowledge Sharing in Higher Education Institutions', Journal of Advances in Higher Education (JAHE), Vol. 10, No. 1, pp. 29-39. Corcoran, N. and Duane, A. (2018) 'Using Social Media to Enable Staff Knowledge Sharing in Higher Education Institutions', Australasian Journal of Information Systems, Research on Recent Advances in Social Media, Vol. 22. Corcoran, N. and Duane, A. (2017) ‘Management support for staff knowledge sharing in higher education institutions’, Journal of Advances in Higher Education (JAHE), Paper Accepted, Pending Publication. Corcoran, N. and Duane, A. (2017) 'Using Enterprise Social Networks as a Knowledge Management Tool in Higher Education', VINE Journal of Information and Knowledge Management Systems, Vol. 47, No. 4, pp.555-570. Doyle, L., Kelliher, F. and Harrington, D. (2015) ‘How multi-levels of individual and team learning interact in a public healthcare organisation: a conceptual framework’, Action Learning: Research and Practice, [Online]. Available at: http://www.tandfonline.com/doi/full/10.1080/14767333.2015.1122574 (Accessed 11 Feb 2016). Doyle, L., Kelliher, F., and Harrington, D. (2016) ‘How multi-levels of individual and team learning interact in a public healthcare organization: a conceptual framework’, Action learning: Research and Practice, Vol. 13, No. 1, pp. 10-22. Dunne, E., and Kelliher, F. (2013) ‘Learning in action: creating a community of inquiry in a healthcare organization’, Action Learning: Research and Practice, Vol. 10, No. 2, pp. 148-157. Dunne, E. and Kelliher, F. (2013) ‘Learning in action: creating a community of inquiry in a healthcare organisation’, Action Learning: Research and Practice, Vol. 10, No. 2, pp. 148-157. Corcoran, N. and Duane, A. (2018) Organisational Knowledge Sharing and Enterprise Social Networks: A Higher Education Context. In Peres, P., Moreira, F., and Mesquita, A. (Eds). Educational and Social Dimensions of Digital Transformation in Organizations , Chapter 5, October, Available at: https://www.igi-global.com/book/educational-social-dimensions-digital-transformation/198518. Coady, P., Byrne, S. and Casey, J. (2015) ‘Should emotional intelligence be developed in university accounting programs? An investigation of employer and graduate attitudes on the skill set requirements for professional accountants’, Paper presented at the Annual Meeting of the American Accounting Association, 8-12 August, Chicago, US. Coady, P., Byrne, S. and Casey, J. (2015) ‘Graduate and employer perspectives on the development of emotional intelligence skills in university accounting programs: Is curriculum innovation needed in accounting education?’, Paper presented at the British Accounting & Finance Association (BAFA) Accounting Education Special Interest Group Annual Conference, 6-8 May, Manchester, UK. Corcoran, N. and Duane, A. (2017) ‘The impact of organisational culture on using enterprise social networks for staff knowledge sharing in higher education’, Paper presented at the 20th Irish Academy of Management (IAM) Conference, 30-1 Aug-Sep, Queens University, Belfast, Northern Ireland. Corcoran, N. and Duane, A. (2017) ‘Using enterprise social networks to support staff knowledge sharing in higher education’, Paper presented at the 4th European Conference on Social Media (ECSM), 3-4 July, Vilnius, Lithuania. Corcoran, N. and Duane, A. (2017) ‘Management support for staff knowledge sharing in higher education institutions’, Paper presented at the SPACE International Network Conference, 26-28 Apr, Porto, Portugal. Corcoran, N. and Duane, A. (2016) ‘Examining ethics for an action research project in an enterprise social network enabled virtual communities of practice environment’, Paper presented at the 19th Irish Academy of Management (IAM) Conference, 31-2 Aug-Sep, UCD, Dublin, Ireland. Corcoran, N. and Duane, A. (2016) ‘Social media for knowledge sharing in communities of practice in higher education’, Paper presented at the 17th European Conference on Knowledge Management (ECKM), 1-2 Sep, Ulster University, Northern Ireland, UK. Corcoran, N. and Duane, A. (2016) ‘Enterprise social networks (ESNs) for staff knowledge sharing in virtual communities of practice (vcops) in higher education’, Paper presented at the 3rd European Conference on Social Media (ECSM), 12-13 Jul, Caen, France. Corcoran, N. and Duane, A. (2015) ‘Social media stages of growth model for knowledge sharing in communities of practice in higher education institutes: a conceptual model’, Paper presented at the 18th Irish Academy of Management (IAM) Conference, 3-4 Sep, NUI Galway, Ireland. Crehan, E. and Duane, A. (2018) ‘Impact of external investment on resource availability and competitive advantage in High Potential Start-Ups (HPSUs)’, The 21st Irish Academy of Management (IAM) Conference, University College Cork (UCC), Cork, Ireland, 3rd-5th of September. Crehan, E. and Duane, A. (2017) ‘Exploring the impact of external investors on resource availability and competitive advantage in high potential start-up businesses from the owner/founder perspective’, Paper presented at the Institute for Small Business and Entrepreneurship (ISBE) 2017 – Entrepreneurial Finance, Nov 8-9, University of Ulster, Belfast, Northern Ireland. Dooly, Z. and Duane, A. (2018) ‘Exploring the configuration and management of an EU funded research network’, The 21st Irish Academy of Management (IAM) Conference, University College Cork (UCC), Cork, Ireland, 3rd-5th of September. Dooly, Z., Duane, A. and O’Driscoll, A. (2017) ‘Exploring structural embeddedness in EU funded research networks’, Paper presented at the 20th Irish Academy of Management (IAM) Conference, 30-1 Aug-Sep, Queens University, Belfast, Northern Ireland. Doyle, J. (Jacqui) and Kelliher, F. (2018) ‘The power of storytelling in the co-creation of tourism experiences’, Tourism and Hospitality Research in Ireland Conference (THRIC), Waterford Institute of Technology, June 17-19. Doyle, L.(Louise), Kelliher, F., and Harrington, D. (2015) ‘How the multi-levels of individual learning and team learning interact in a public healthcare organisation: A conceptual review’, 16th International Conference on Human Resource Development Research and Practice (UFHRD), UCC, June 3-5. Dunne, E., and Kelliher, F. (2012) ‘Creating a community of inquiry in a healthcare organisation’, Action Research Colloquium, Waterford Institute of Technology, May 24-25. Hagl, R. and Duane, A. (2017) ‘Exploring the development of a framework to support entrepreneurs in the creation of dynamic business models for high-potential technological innovations’, Paper presented at the 20th Irish Academy of Management (IAM) Conference, 30-1 Aug-Sep, Queens University, Belfast, Northern Ireland. Hagl, R. and Duane, A. (2018) ‘Exploring the Impact of Augmented Reality and Virtual Reality Technologies on Business Model Innovation in Technology Companies in Germany’, The 29th Australasian Conference on Information Systems (ACIS), UTS Sydney, Australia, December 3rd-5th. Heneghan, M., Claffey, E. and Morrissey, P. (2018) ‘The moderating role of online social influence in switching of personal current account, The 21st Irish Academy of Management (IAM) Conference, University College Cork (UCC), Cork, Ireland, 3rd-5th of September. O'Nolan, L. and Griffin R. (2017) ‘Strategy, consultation, their theatropoesis and its improvisations’, Paper presented at the 33rd EGOS Conference, Jul 3-8, Copenhagen Business School, Copenhagen, Denmark. Ryan, R., Egan, T. and Burke, R. (2018) ‘Embedding risk management in a public-sector organisation through a facilitation approach: an exploratory study’, The 21st Irish Academy of Management (IAM) Conference, University College Cork (UCC), Cork, Ireland, 3rd-5th of September. Denis will then contact you in due course to let you know the date of our next open evening for the programme together with full details of the application process.